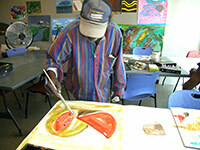 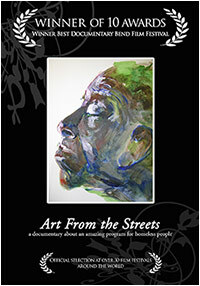 Art from the Streets is a feature length documentary about a program for homeless artists called Art From the Streets. 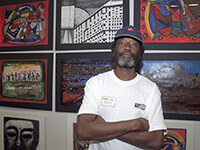 This all-volunteer program was established in 1991 with the idea of providing a safe and nurturing environment for homeless people to produce art. 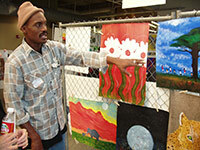 They accomplish this mission by sponsoring twice weekly art “classes” and an annual show to sell their work. 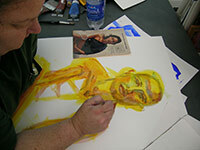 The film tells this story by tracking five of the artists over the course of a year. 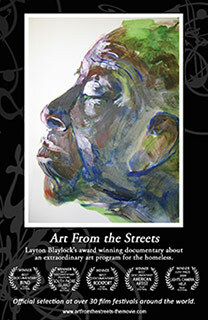 Viewers will visit homeless camps, learn the daily challenges of street life, and witness the strengths of human character. 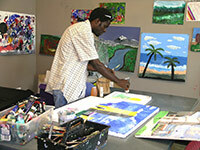 You will also experience the 2-day show and sale where the artists’ work is sold and where they interact with people that they rarely have a chance to encounter in such a positive way. 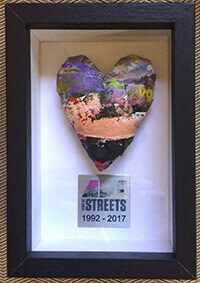 To view the Art From the Streets trailer, please click here!